A "no trespassing" sign marks the southern terminus of the Belfast Rail Trail by the Penobscot McCrum potato processing plant. City officials would like to get an easement to connect the 2.3-mile Rail Trail with the Belfast Harbor Walk. BELFAST, Maine — The city took a major step Tuesday night down the road toward using eminent domain to purchase a controversial recreation easement across land owned by Penobscot McCrum. Belfast city councilors unanimously voted at the regular council meeting to adopt a resolution and order that the city acquire the easement by eminent domain and that the city manager and city attorney take the necessary steps to prepare a so-called “certificate of taking,” which they will be asked to approve at the next regular meeting on Tuesday, Aug. 2. Until then, there is still time to negotiate a deal with the company. Before adopting the resolution, councilors used occasionally strong language to describe their frustration with Penobscot McCrum, a frozen potato processing plant located on the banks of the Passagassawakeag River. 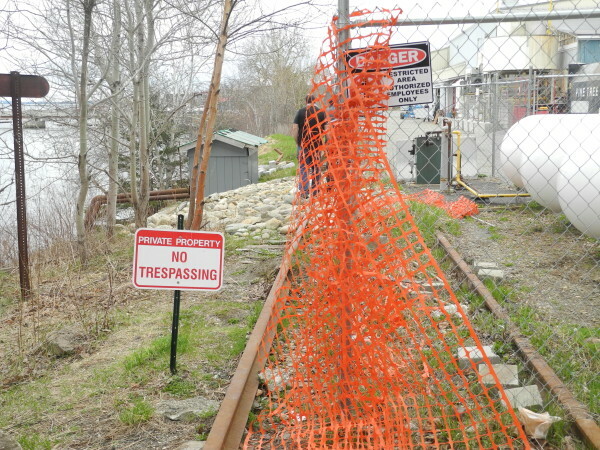 City officials said again at the meeting that they have been trying for years to negotiate with owner Jay McCrum to find a way to cross the 700-foot-long strip of land and connect the new 2.3-mile rail trail with the Belfast Harbor Walk and downtown. City Attorney Kristin Collins said that she has made numerous attempts to speak to the company’s attorney, Ed Bearor of Bangor, by telephone and email, ever since a July 6 meeting between the two parties. Although McCrum has said publicly that safety is his big concern with the recreation easement, the city has received no response to its proposals to put up fences and lighting, according to the attorney. Until Tuesday morning, when Bearor sent an email to Collins about land value, the town had received no response at all. Collins told councilors that she believes the email acknowledges the “lawfulness and rightfulness” of using eminent domain to purchase the easement, and that the value of the recreation easement is the only thing left to be argued. In the resolution, the city notes that at the June 21 public hearing on the matter, members of the public who spoke were “overwhelmingly in favor” of pursuing eminent domain if negotiations proved unsuccessful. Councilor Mary Mortier did not mince words when she described the process of reaching out time and again to the company but hearing nothing back. Councilor Neal Harkness said that he also is dismayed by what has happened.